Most website monitoring services follow the “freemium” model – they have free plans for basic downtime & uptime monitoring of a website but need to pay for unlimited email or SMS alerts. You may also need to upgrade to monitor multiple websites. There’s a good alternate though. You can create your own website monitor that runs on Google servers and sends email alerts or SMS when your website goes down or is up again. It logs everything in a Google Spreadsheet or you can even store the downtime activity inside Google Analytics. Click here to copy the website monitoring Google sheet into your Google Drive. You may either use your Gmail or Google Apps account to sign-in. Go to the Website Monitor menu (near Help) and choose Configure. You may have to authorize the sheet the first time you configure the monitor. [Optional] Enter the Google Analytics Id (e.g., UA-123456-78) and the site monitor will log downtime / uptime events in your Analytics account. You can turn on “Get text messages” to receive download alerts by SMS* on the mobile phone connected to your Google account. 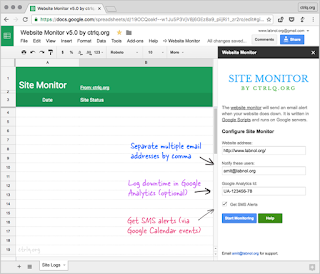 Click the Start button and the Google sheet will start monitoring your website in the background. You can close the sheet. The script triggers every few minutes and then tries to fetch your website using URLFetchApp, a Google service similar to wget or curl. If the HTTP response code is anything other than 200, it indicates that there’s an issue with your website and an email alert is sent. Google Apps Script can send email messages through Gmail but uses a workaround for sending SMS text messages. It creates an event in your default Google Calendar with an SMS reminder – the event is set to expire in 30 seconds and thus you get an instant text alerts on your mobile.